Attorney General Eric Holder announced his resignation on September 25 after leading the Justice Department since the first days of President Barack Obama’s term. 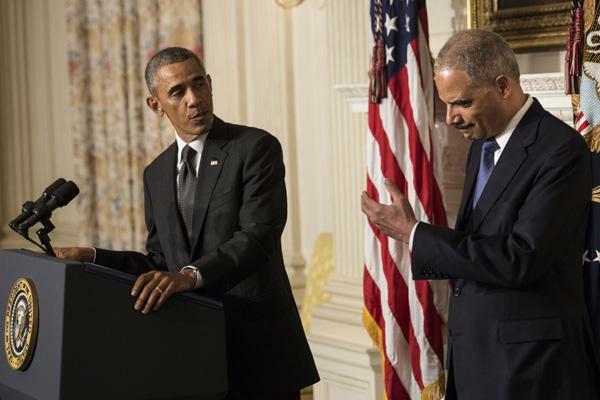 Eric Holder, 63, is the fourth-longest-serving attorney general in US history. America’s first black attorney general and an unflinching champion of civil rights in enforcing the nation’s laws is the administration’s point man on the civil rights investigation into the police shooting of an unarmed 18-year-old in Ferguson, Missouri. He won’t leave until a replacement is confirmed, which means he could remain in office for months. In an emotional ceremony at the White House, President Barack Obama said Eric Holder did a “superb job” and credited him with driving down both the nation’s crime and incarceration rate – the first time they have declined together in more than 40 years. “He believes as I do that justice is not just an abstract theory,” Barack Obama said. Only three other attorneys general in US history have served longer than Eric Holder. He also is one of the longest-serving of Barack Obama’s original Cabinet members. Two others remain: Education Secretary Arne Duncan and Agriculture Secretary Tom Vilsack. Eric Holder and his wife are close personally to the Obamas, having recently vacationed together on Martha’s Vineyard, and Barack Obama told him of his intention to depart over the summer. White House officials said Barack Obama had not made a final decision on a replacement for Eric Holder, who was one of the most liberal voices in his Cabinet. White House press secretary Josh Earnest said naming a new attorney general would be a high priority for the president. Some possible candidates that have been mentioned among administration officials include Solicitor General Don Verrilli; Deputy US Attorney General James Cole; White House Counsel Kathy Ruemmler; Preet Bharara, the US attorney for the Southern District of New York; Jenny Durkan, a former US attorney in Washington state, and Senator Sheldon Whitehouse, a former Rhode Island attorney general.